John Dodson will look to bounce back from a loss to Brazil’s Marlon Moraes when he heads into enemy territory later this year to face Pedro Munhoz. 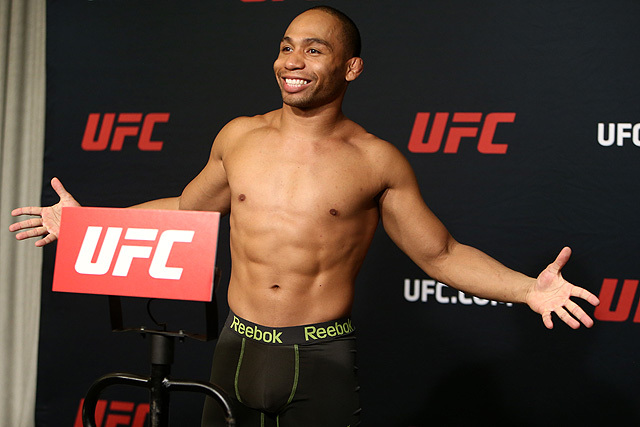 The UFC has booked top bantamweight contender John Dodson for a bout against Pedro Munhoz in Brazil next month. Dodson vs. Munhoz will take place on the UFC Belem (UFC Fight Night 125) card in Belem, Brazil. The promotion’s Brazilian arm announced the news on Thursday. Dodson (19–9), winner of The Ultimate Fighter 14, has traded wins and losses since his second defeat at the hands of flyweight champion Demetrious Johnson. 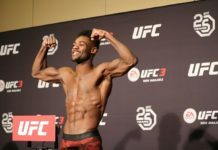 That loss, and the unlikelihood of a third shot at flyweight gold, sent him back up to the 135lb weight class (his TUF 14 win also came at bantamweight). Besides the Moraes loss, Dodson has lost to John Lineker in the UFC’s 135lb division. He has also, however, defeated Manvel Gamburyan and top bantamweight Eddie Wineland. Pedro Munhoz (15–2 (1)), meanwhile, is on a four fight win streak since a loss to Jimmie Rivera in 2015. During that stretch, he has captured three Performance of the Night bonuses. The Brazilian, who will have the fans on his side at UFC Belem, is a former RFA bantamweight champion. UFC Belem takes place at the Arena Guilherme Paraense in Belem, Brazil on February 3. 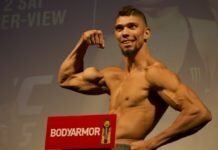 Former LFA middleweight champion Eryk Anders faces former UFC light heavyweight champion Lyoto Machida in the main event. Editor at Cageside Press, Jay has been covering the sport of mixed martial arts for several years. His work has appeared on The MMA Corner, What Culture, Cage Pages, MMA News, Today's Knockout, and Fox Sports (via Fansided). Jay holds an Honours Bachelor of Arts degree in English from the University of Guelph, and a Certificate in Leadership Skills from Humber College. When not slaving at the keyboard, he can be found in the company of his dog, a good book, or getting lost in the woods.